Over the years I’ve gathered quite a bit of information from many sources on the various types of metal lures and how they are used. What follows is a synopsis of this information so I’m not for one minute claiming it is all my own work. However, if you are looking for a definitive book covering all lure types then “The Book of Lures” by Ron Calcutt and Timpson (ISBN 0 7318 1208 5) would take some beating. 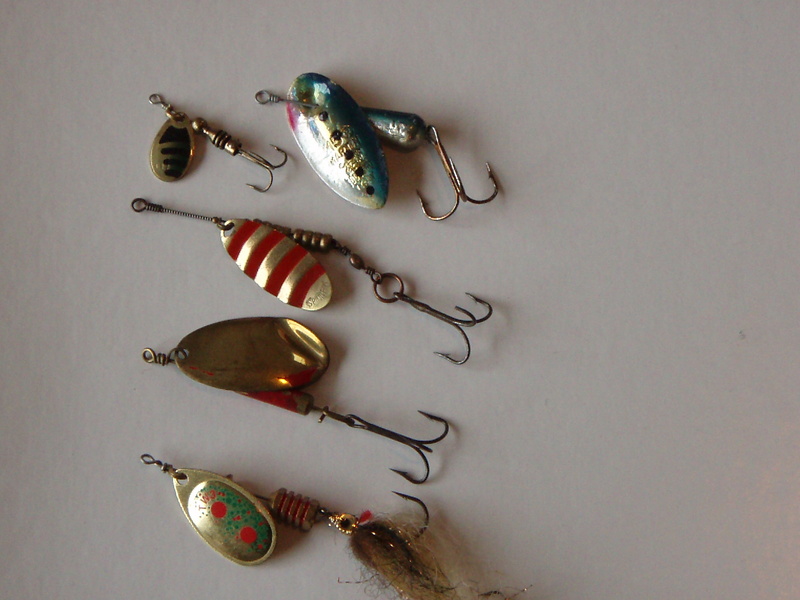 Metal lures are generally grouped under four categories namely spoons, slugs, jigs and blade spinners. Spoons are arguably the oldest form of metal lure and angling folklore has it that they were originally hewn from the cupped section of a teaspoon or tablespoon. Numerous modifications have been made to the curvature, width and length of the basic spoon shape over time to alter action, improve stability underwater and lengthen casting distance. Today the spoon category includes everything from the original hammered “penny” spoon to the ubiquitous Toby style lure with its slender baitfish profile. Spoons with an egg shaped profile (ovoid) should be retrieved slowly. The greater the curvature of the body, then the slower the retrieve speed should be. If heavily cupped lures are retrieved too quickly then they start to spin and lose their enticing wobbling action. Ovoid and heavily cupped spoons are often difficult to cast in windy conditions. The slender baitfish shaped spoons, such as Toby’s, generally are less curved and have a tighter action which means that they can be retrieved slightly more quickly. If the lure is constructed from heavier gauge metal then it will have even less action and can be retrieved at a much quicker pace. Obviously faster retrieves will appeal to predators that prey on fast moving baitfish. The other major benefit of slender spoons is that they are more aerodynamic and can be cast further, especially in windy conditions. I normally watch the rod tip when retrieving these lures and try to settle on the retrieve speed that makes the tip “nod” most vigorously as this tends to match the most effective cadence of the lure. There is very little difference between casting slugs and jigs as far as the shore based angler is concerned. Both are a streamlined slender shape and constructed from dense metals which enables them to be cast long distances. Jigs tend to be deeper in the front section whereas casting slugs tend to be of uniform slimness throughout their length. This is evident in the photograph above where the two middle lures are the two casting slugs. These lures should be retrieved at speed as this makes the most of their limited action. Slugs and jigs tend to track close to the surface when retrieved quickly which makes them very attractive to predators attacking from underneath. When the whitebait are running small slugs and jigs retrieved at speed can be deadly, especially on Kahawai. Slugs and jigs that are more angular and curved when viewed head on will have more action when retrieved. These lures can be retrieved more slowly than normal and a rip-pause rod action can be effective if the water depth allows. In clear water the most effective slugs and jigs are often chrome or gold plated. This is due to the reflected flash from sunlight landing on the plated surfaces when the lure is running near the surface making it appear more lifelike. Blade spinners consist of a wire blade which rotates around a central wire shaft. They were enormously popular in the first half of the 20th century but have fallen out of favour in recent times, except with trout fisherman. The main reason for the fall from grace is that they historically caused line twist when fished in any sort of current. The main difference between blade spinners is the shape of the blade and how it rotates. There are four types of blade spinners, each with a different shaped blade. The different blades spin at a unique speed and angle which results in a distinctive pulse being emitted. Colorado – Elliptical, round blade that often has a dished profile similar to a culinary spoon. Colorado blades give a large profile to the lure, a strong pulse and track off the bottom due to the high water resistance of the rotating blade. Blades of this type are excellent for coloured, snag laden water. It is difficult to fish this type of lure down-current (i.e. with the current) as the blade can stall if the water pressure on it is too low. Indiana (or French) – A longer elliptical blade which looks like a wide water droplet. 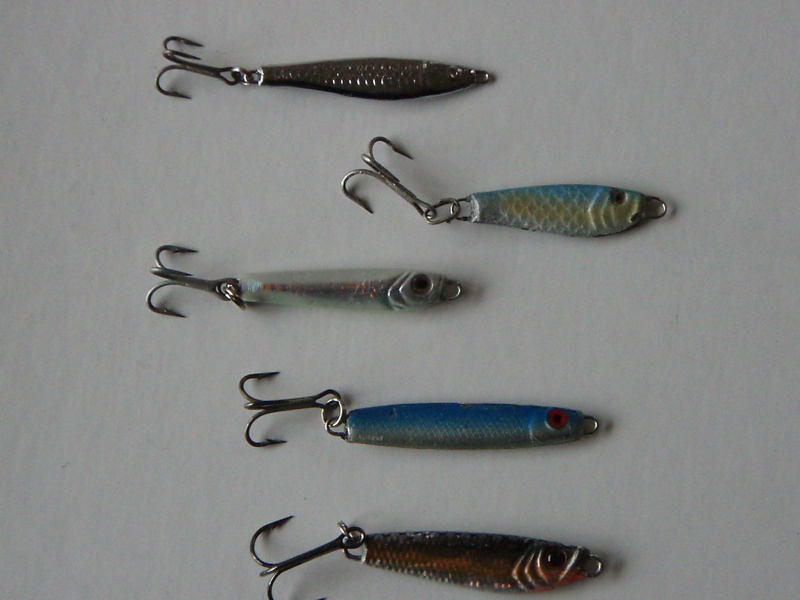 In the photograph above the left lure in the top row and the bottom lure have Indiana blades. When retrieved this blade gives a smaller lure profile than a Colorado blade but a faster blade rotation and less pronounced pulse. This blade type is ideally suited to down-current spinning and can be fished fast or slow, deep or shallow. The lure second to bottom in the photograph is an Indiana blade that has a upward bend at the outer tip of the blade to change its pulse. Willow Leaf – This blade has a long and narrow oval shape (striped blade in the second row in the photograph) which gives a slender profile when retrieved. This blade will give maximum flash as it rotates close to the body of the lure. The pulse is much less pronounced than either a Colorado or Indiana blade but has a higher frequency beat. The low water resistance offered by the blade allows it to stay deep on the retrieve but it is very hard to retrieve down-current, especially in strong flows. Convex – Concave – This blade shape is shown in the lure on the right in the top row of the photograph. Unlike the other blades (which are attached to the wire shaft using a clevice or u-shaped connector) the wire lure shaft actually runs through the end of the blade. The blade is concave where the wire passes through it and convex at the end furthest from the wire. This blade type works well when retrieved down-current as the blade offers moderate water resistance. Unlike the other blades, the convex-concave type often attracts strikes as it is descending through the water column as the blade spins like a helicopter blade around the shaft. Blade spinners are ideal for fish down-current to fish stationed on the bottom facing the current. In this situation the lure is cast upstream and retrieved slightly faster than the current flow. If you are spinning with nylon monofilament line is important to ensure that a high quality ball bearing swivel is attached to the tow point of the lure to minimise line twist. A swivel with a clip seems to work best to offset the rotation of the lure during the retrieve. If you are using braid then line twist is much less likely to be an issue and it may be possible to dispense with the swivel altogether. My “go to” lure for prospecting is the Toby. Tobies are relatively cheap, easy to cast into the wind and highly effective. While many other lures have come and gone, the humble Toby still catches kahawai, snapper and trevally as well today as it always has. Kilwell made Toby lures in Rotorua under licence to Abu for many years, using Abu approved equipment, until the global patents ran out. They still make them in NZ under either the Toby or Turbo brand and can be purchased either on line (www.kilwell.co.nz) or from your local tackle store. Black and gold works best in murky water and dull, overcast conditions. Variants with a high proportion of silver seem to deliver in clear water on bright, sunny days. Anglers should carry a small selection of metal lures in their tackle boxes. Limit the number of types and have a couple of different weights of the same lure type. Learn how to use them effectively. Experiment with retrieve speeds, lure weights and angles until you find out what works best. Another good article here Alan, thanks. I am a fan of the spoons, I will confess. Their allure and unpredictable retrieve to me makes them an ideal selection across a range of target species. Kahawai cant resist them and Kingfish are next on my hit list.